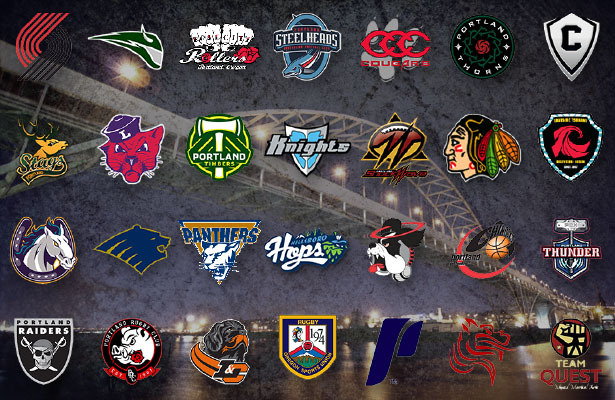 Portland has more major league, minor league, semi-pro and college teams than you know about. I promise. I don’t mean to sound like some hipster announcing a band that “you’ve probably never heard of,” but it’s fair to assume that you’re about to see some team that’s new to your world. In fact, unless you’re some sort of freaky Portland sports buff, I’d guess you’re about to learn of multiple teams that call the Portland area home. The Rose City is home to at least 29 teams competing at the college level or higher. And even though we like to think we found them all, chances are we missed a couple (feel free to let us know if we did). On top of that, there are scores more that compete in all sorts of competitive leagues. But we’re not here to brag about a dodgeball team or wiffleball league (we’ll get into all of those this Spring). We also didn’t include any club sports, youth squads or semi-competitive traveling teams. We categorized the teams into three groups: Professional, Semi-Professional and College. In order to be dubbed a Pro, there has to be some serious money being thrown at the team. So while the Portland Stags play “major league” ultimate, they’re not exactly competing with the Timbers for coverage on OregonLive. Beginning Monday, Jan. 27, we’ll introduce you to every team on our list. You’ll learn the history behind each team and why you should root for them. Our first week includes all the obvious major teams, but we’ll quickly dive into the lesser-known levels before you know it. Looks like you put NBA for the Arena Football team. Great to know all (or most) of the teams around here! Thanks for the catch! I just updated that part. You forgot the Portland Monarchs. They’re in the same league as the Portland Raiders (PFL). Just added them! Thanks, Mike.